On the 12th October 2017 a new policy was announced by the Department for Business, Energy and Industrial Strategy (BEIS) called “Boiler Plus”. This new policy will now form part of building regulations, and will also require a new minium performance standard for domestic gas boilers in English Homes to be set at 92% ErP*. The outcome of this Policy is that everyone should have access to a decent home that is affordable to run, comfortable to live in, and sustainable for the future and as a result of much public feedback new standards for domestic boiler installations in England were introduced from 6th April 2018. Require combination boiler replacements to include the provision of an additional energy efficiency measure to be installed at the same time. *ErP – The ErP Directive aims to phase out poorly performing products across a range of product groups to reduce carbon emissions across Europe, with the ultimate goal of achieving the EU’s 2020 targets. Suitable levels of cleaning and protecting the heating system from debris. We offer the best possible service, at reasonable rates, for all of your plumbing and heating requirements. What are the new standards in Boiler Plus? The new standards we have outlined in the Boiler Plus policy document improve the way many people use energy in their homes by giving them greater choice, greater control, and tangible savings on their energy bills. The new minimum performance standard for domestic gas boilers in English homes will be set at 92% ErP. The standard will also make timers and room thermostats an explicit requirement for all gas and oil systems, putting beyond doubt the need to give consumers the power to achieve the greatest comfort in the home. The UK is a global leader in the gas boiler market, which has continued to develop cutting edge technologies that now exceed the minimum standards set last decade. Raising standards will maintain this strong market position, as a global leader, and will ensure English homes provide people with the advances they expect and the comfort they deserve. The Boiler Plus policy achieves this while reducing fuel consumption, meaning that bills will fall and carbon emissions are curbed. By offering consumers a choice of technologies, they can choose a setup that best fits their lifestyle, and by ensuring all households have heating controls in place, we can help drive down bills. When and where will the new standards apply? They are publishing the new standards as an amendment to the Domestic Building Services Compliance Guide, which can be found at https://www.gov.uk/government/publications/conservation-of-fuel-and-power-approved-document-l. From April 2018 the new standards will apply whenever a boiler is installed in an existing heating system anywhere in England. This means when households in England replace an existing boiler, or purchase a boiler for the first time in an existing dwelling, they will start to make savings right away. But won’t this add a cost at an already expensive time? The new standards only apply when a consumer replaces their boiler, and can be met with a one-off payment of as little as £50. This could be made back through the savings in bills, which will continue to accrue long after the initial costs are recovered. Some households already comply, without further investment. What if customers can’t afford the new boiler? A new boiler can be an expensive outgoing. This policy does not compel anyone to replace their boiler, it raises expectations for boilers so that if and when they do replace it they can be more confident that they are investing in an efficient product that will keep their bills as low as possible. Will there be a requirement to retrofit boilers? No, these changes will only affect consumers when installing new boilers or when it is time to replace their current boilers. Do installers know how to work with the technologies in the new standards? It is important that standards are set at a level that is not beyond the capability of our installers. The technologies featured in the new standards are all existing, established technologies, which are already familiar in some fashion to most installers. Through consultation we have learned that most installers see it as part of their job to keep up with technological developments, and so those who are not already confident with these products may choose to take advantage of the wide range of training that exists, much of which is provided for free. Individuals who do not see the value in keeping up with developments in their own field may struggle as the market moves forwards without them, irrespective of the new standards. We are continuing to work closely with industry to make sure information is readily available. Does the 92% ErP standard apply to the boiler or the system label? Could I reach 92% ErP by combining a 90% ErP boiler with a weather compensator? The requirement applies to the boiler as an individual product. The boiler itself must have a product label of 92%, irrespective of the overall system label. This ensures all households benefit from a highly efficient boiler, no matter what decisions are made regarding controls devices or other energy saving measures. A boiler below 92% ErP does not comply, even if the system label is brought up to 92% by other components. What about heat only and system boilers? Many system boilers and most regular boilers on the market today require additional work to make them compatible with the energy saving devices included in Boiler Plus. This may involve additional costs and additional knowledge for the installer, without which there may be a risk of Legionella. While there is still benefit to be derived from installing these measures in heat only and system boilers, the health and safety of householders is paramount and no such risk should be tolerated. It makes sense to first apply the new standards in systems where there is no risk, without any additional work, and consider extending the rules in the future when installers and manufacturers have time to adapt. Beyond support through the Renewable Heat Incentive (RHI), our ambition is to phase out the installation of high carbon fossil fuel heating in new and existing buildings off the gas grid during the 2020s, starting with new buildings as these lend themselves more readily to other forms of low carbon heating. Rather than setting an unambitious efficiency standard for oil boilers in the interim, we will focus policy in this area on measures to improve the consumer proposition for moving from oil heating to low carbon alternatives. We will involve businesses and industry in developing our new policy. When commissioning fixed building services installers are required to test performance and make adjustments as necessary to ensure that they use no more fuel and power than is reasonable in the circumstances. Although hydraulic balancing is not explicitly mentioned in the Domestic Building Services Compliance Guide, it is clear that a competent engineer should not conclude an installation without ensuring that it is working as intended, including checking that all radiators are heating up at a similar rate. What does Boiler Plus say about ‘smart thermostats’? Smart thermostats are extremely diverse products with growing consumer appeal. All smart controls have the potential to deliver energy savings, but the diversity of products means some can offer greater benefits than others. Boiler Plus identifies and requires specific functionalities with proven benefits: load compensation, weather compensation, or automation combined with optimisation. Some of these functions are commonplace even in standard, non-smart thermostats, so it is reasonable to expect them in products that are presented as ‘cutting edge’. More basic smart controls are also likely to have the potential to offer benefits, but this remains unproven. Shouldn’t policy focus on driving insulation? BEIS is committed to achieving the government’s pledge of improving the energy efficiency of existing homes. There are several key policies that support insulation as a method of achieving this goal, including the Energy Company Obligation, the Green Deal and also regulations for the Private Rented Sector. More information can be found at gov.uk. Hand in hand with efficient buildings, the new standards increase boiler efficiency to ensure that consumers have a higher degree of control over how to heat their homes, providing greater comfort and lower bills. Shouldn’t policy focus on renewable energy? There is a clear and important role for renewable heat in meeting our carbon targets. The Clean Growth Strategy sets out in detail how we will achieve this, with a move to more renewable sources of heat over the coming decades. In the meantime, raising standards for boilers presents an opportunity to improve energy efficiency in millions of homes, saving carbon emissions now, while giving householders greater comfort. These changes will also help lay the groundwork for even greater change in the future, by supporting low temperature systems. The description for ‘automation’ in smart controls refers to “stored data from user adjustments over time”. What does this mean? The term ‘automation’ is used in different ways across smart industries. A broad interpretation can be applied to Boiler Plus, and “stored data from user adjustments” includes user preferences that have been entered manually. Some smart controls monitor and learn preferences, rather than relying on manual input. It is important to understand that in this context the device must be smart, irrespective of whether user preferences are entered manually or automatically, and must include optimisation, as defined in the 2018 amendments. 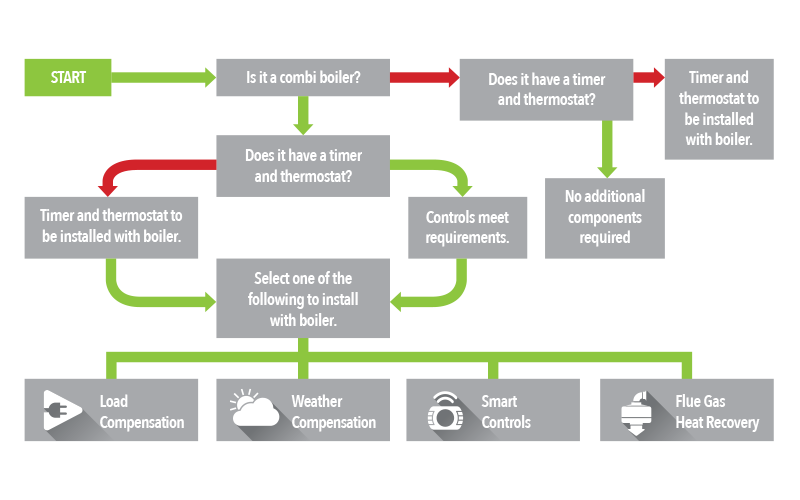 Are TPI controls included in Boiler Plus? No. The description given for load compensation should not be misinterpreted as including TPI controls. The Domestic Building Services Compliance Guide identifies the technologies in scope and provides descriptions based on SAP definitions, and TPI controls are not included. This decision and the rationale are set out in the Boiler Plus policy document. This does not prevent consumers from choosing to install TPI controls where this aspect of Boiler Plus does not apply, such as with an oil boiler. However, even when Boiler Plus does not apply consumers should consider their heating control options carefully and seek advice to ensure they install the device that will offer them the greatest benefit.